Regardless of whether you live around Lee’s Summit, North Town, Overland Park, Mission, or Olathe, you can get your vehicle serviced today at Volkswagen Lee’s Summit. That’s why we’ve created this Volkswagen Tiguan dashboard symbols guide, to help you determine when it’s time to get in touch with our team. There are typically two types of dashboard symbols/warning lights on the Volkswagen Tiguan. Here’s a closer look at some of the red lights that you might notice on your VW Tiguan front dashboard. • Coolant Warning: Low coolant levels or high coolant temperatures are the name of the game here. This symbol looks like a thermometer in a shallow pool of water, and it’s pretty serious. • Tire Pressure Monitoring System: All the new-production cars on American roads are strictly required to come with a Tire Pressure Monitoring System. If yours is triggered (whether that’s by a low-pressure tire or an outright flat), it’s going to show up as an exclamation point within a tire. 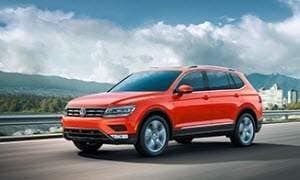 • Charging System Failure: Without your VW Tiguan charging system, your vehicle is basically useless. Not only is it responsible for important systems, like the air conditioner and the audio interface, but you won’t even be able to start your engine without it. It looks completely like a battery. • Hood Open: This VW icon looks like a car with its hood open, and it’s telling you to close yours! • ABS/Brake System Malfunction: An exclamation point within a circle denotes an ABS or Brake System Malfunction (however, don’t confuse it with the TPMS icon that we mentioned above). Please get in touch with us soon if you need to schedule service for any of the red/yellow VW Tiguan lights. Not only are our expert-automotive technicians well-versed in the Volkswagen Tiguan dashboard, but they’ll carry out all their work with the most professional attitude possible. That means that they’ll service your vehicle efficiently, effectively, and courteously, treating you with the respect you deserve. If this type of VW service experience appeals to you, then we encourage you to set up an appointment today at Volkswagen Lee’s Summit. We’re here to serve all our many Kansas and Missouri customers!